There is a new economy growing all around us. Whether you lead a business or work in one, are a freelancer or employee, are beginning a career or working your way up the ladder, Shift provides a guide to the major changes that are reshaping the economy and our lives. Haydn Shaughnessy spells out why the current economic transformation is different from anything that preceded it. The digital economy is not just about new technology. Dramatic changes are taking place in how people work together, how they think about society and wealth, and the risks and options they face in employment and business. Haydn draws a detailed picture of new power groups that are driving this new economy—turning rapid innovation into real-time disruption. These power groups are rendering governments increasingly irrelevant in their traditional job creation and economic growth roles, and putting more demands on companies and individuals in an economy increasingly dominated by hyper-success stories like Apple and Google. 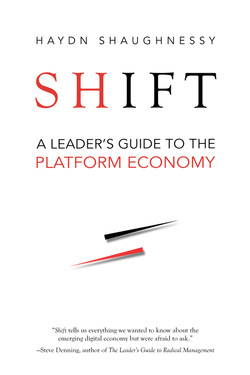 Shift is essential reading for anyone who wants to understand the digital revolution that is changing economic policy, work and prosperity for the vast majority of people. It is a survival guide for the 21st century economy. Haydn Shaughnessy trained as an economic historian at the London School of Economics and Oxford University. He is a research fellow at the University of California, Irvine, and a former fellow of the Society for New Communications Research. He was a visiting fellow at Genera Insight, a senior research associate of the European Institute for the Media, and the Centre for Employment Research, at Manchester Victoria University and Manchester Metropolitan University respectively. He worked as a program manager for advanced communications projects at the European Union in the early 1990s where he wrote about 3G, Fiber to the Home and Advanced Electronic learning environments. He was a partner at The Conversation Group, the first social agency, and has advised major companies and government departments in the Netherlands, Sweden and the European Union. Haydn wrote the “Re: Thinking Innovation” column at Forbes and has written on innovation for the Irish Times. He has also written for Gigaom, The Wall Street Journal, the Times, Radio Times, and many others. His work also embraces semantic analysis of emerging patterns of thought and behavior.